Self-storage can be a plus in our lives, but like any expenditure, you want the most for your money. Here are some clever ways to save on self-storage. Get free stuff. Whether it’s a free lock, free moving boxes, or free use of a moving truck these are all things you need when storing your belongings. Take advantage of these promotions when they are available. Promotional storage rates. Always ask self-storage providers about special rates. Whether it’s an introductory offer of 50% off, or a free month, money saved is cash in your pocket. Long term rental discounts: Statistically, the average duration people rent self-storage is 12 to 18 months. Ask about long-term rental discounts. Renting a self-storage unit for six months or a year might make you eligible for a better rate. Military, emergency personnel or student discounts. Self-storage facilities often offer special discounts for these customers if you present a current piece of ID that says you belong to one of these groups. Don’t use climate controlled storage unless you really need to: Climate controlled storage is more expensive, so don’t use it unless it’s needed. This type of storage is only necessary if you are storing sensitive items like musical instruments, exotic wood furniture, old pictures, family heirlooms, antiques, or electronics. Read our blogs on heated storage and storing TVs to see if you need the extra expense of climate controlled storage. Share Space: Self-storage is rented by the square-foot. The bigger the unit the cheaper it is by the square-foot. So, consider sharing a larger storage unit with a relative or trusted friend to chop your rent by 25% to 50%. Only Store the Good Stuff: You wouldn’t stuff a safety deposit box with worthless trinkets. So, don’t turn your storage unit into an over-priced garbage bin. Carefully scrutinize everything you want to store. Also, efficiently organized storage will minimize the size of unit you need. 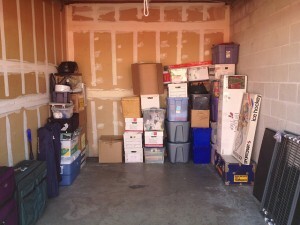 To help with this process, check out our blogs on downsizing and how to pack a storage unit. Think about Combining a Storage Unit with a Smaller Apartment: If you have the flexibility, think about downsizing your apartment and putting the extras into storage. This can save you hundreds of dollars a month in rent. By spending time finding the best deal and being thoughtful about what you store you will find self-storage that works for your lifestyle and your budget.